First of all, I want to take a minute to thank all of you. When I started this blog, I had no idea what was in store. I saw it as a way to share my journey and to maybe keep a few friends and family members in the loop with what was happening. I never saw sponsors, ambassadorships and really awesome lifetime connections as a possibility. When my topics started to change a little because of lifetime events, I saw it as a way to show what real life is and what happens when not everything goes according to plan. I expected most readers to drop off. But, instead, a lot of you have stuck with me and many new ones have started following along. I feel blessed and thankful and just wanted to use this opportunity to share that publically. Seriously…thank you all! On to other things. A theme lately for me – which many of you have seen – is that not everything goes according to plan. Whether those plans are made with the right motivations and intentions, or whether they’re not, things just don’t always happen the way we think they will. Flexibility is key. So is trust. Lately I’ve learned about it a lot. From different opinions on what’s right, what’s wrong, what’s happening, what’s best, what’s not, what’s right to one person, what’s right for another person and so on, lots of people – friends, professionals, family members – have things to say. Some is with our best interests in mind. Some isn’t. Some is based on what’s right for them. Some isn’t. Some times the opinions of 100 people can all conflict and cause confusion, chaos and weariness. Sometimes it’s best to set those things aside. To focus on what you believe and your goals and motivations and to push forward. No path is right for everyone. We are all on our journeys and while there are black and white areas of life, there are a lot of places that allow for differences…for differences in actions, for differences in opinions and for differences in where to go next. I spent a whole lot of time in the past worrying about those things. I like to make people happy. I worry about what I say and how it comes across. I spent a lot of time worrying about how my actions influenced other’s thoughts about me…It wasn’t a good place to be. In fact, it caused a whole lot of unnecessary stress and it stopped me from experiencing the joy that was literally waiting all around me. I stopped trusting in myself and my believes and started listening to the often-conflicting views of everyone else. Bottom line: I was taking away from the experience that life was waiting to offer me. Have you been in that place? In that place where you get so caught up in everyone else’s “right” or everyone else’s “plan” that you lose sight of yourself? Of what’s important to you and where you want to go? It’s not a fun place to be for sure. My solution? I’m focusing on trust. I’m going back to the basics and I’m evaluating what’s right for me and for my family. I’m weighing options and consequences. I’m changing the way I make decisions and I’m focusing on what’s right in the here and now for my family. I’m going back to finding my center while balancing beliefs with goals. For me, this means to find joy in all situations and to give thanks. To take fears and anxieties to the creator and to trust that in all things he has our best interests in mind. Where do you need to find focus today? 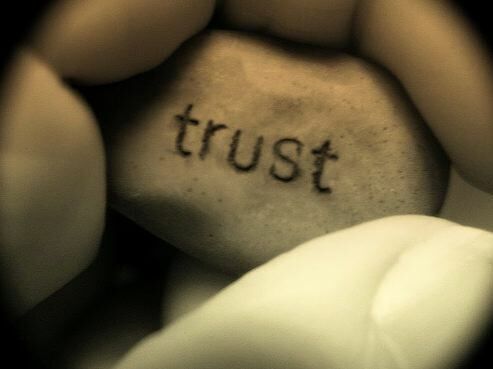 What do you need to put your trust in? I know where I’m at, and it’s an exciting place to be!